Since the days of old, the people of Suwa in central Japan’s Nagano Highlands have held Onbashira, their mythic festival of renewal. Every six years they join together and haul enormous wooden pillars by hand from the surrounding mountains down to the local shrines. 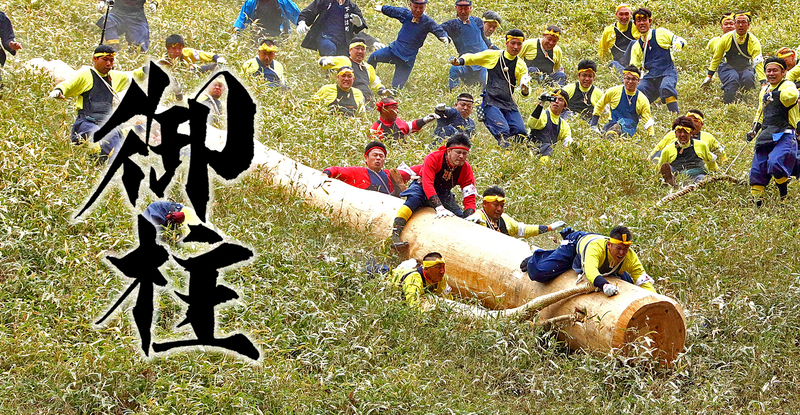 Onbashira is a festival of simmering energy, earthy pomp and pageantry, famed for the valor of devotees who ride pillars down a steep section of mountainside. While kiotoshi (the pillar riding ceremony) is certainly thrilling, there’s far more to Onbashira’s story. The festival is an exuberant celebration of community and local culture. With its roots in the deep past and ties to the natural world, Onbashira is like nothing else on the planet. The last Onbashira was in 2016, and the next is scheduled to begin in April 2022. If you’re considering making the journey to Suwa for the festival, we hope these pages will be a useful guide. Beyond the practicalities, this site aims to give a peek into a world rarely seen by outsiders. Our blog gets past the sensationalism and looks at what Onbashira means for those who live it. Throughout the celebration, kokoro-hitotsu is a constant refrain. “One heart,” they say. While the region and the festival have many sides, at its core Onbashira is one.